You’ll just need puff pastry and sugar to make this dessert. Sometimes it doesn’t take much to prepare something special in the kitchen. 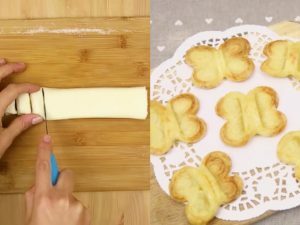 Easy to make and so delicious: these butterflies are perfect with some tea or hot chocolate on a cold winter day! Overlap pink dough on the white dough and roll a rectangle. Cut it in a half, and cut halves in a triangles. 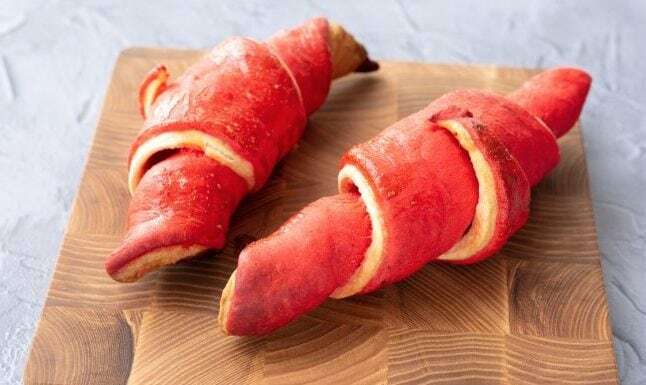 Put 1 tsp of jam on the dough and roll it. Grease with egg wash and bake at 200C/400F for 15-20 minutes.